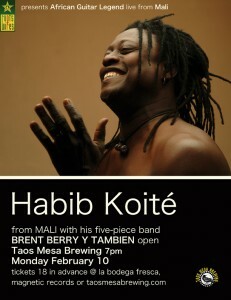 Habib Koité (say Kwa-tee) brings his much-extolled talent to the Taos Mesa Brewing Company on Monday, February 10th at 7:00 PM. In 2012, Koité sold out the Lensic in Santa Fe when he played with bluesman Eric Bibb for a Mali Meets Mississippi show. He’s played Santa Fe solo and with his band, but as far as Henderson knows, Koité has never played in Taos. 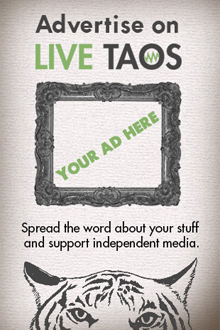 The show at Taos Mesa Brewing is the only show he’s doing in New Mexico this tour. Koité was a world music superstar of sorts in the 1990’s, partly due to his association with Putumayo Records. With his band Bamada, which he formed in the late 1980’s, he recorded a number of highly successful albums and toured the world. To create a new sound for his album Soo, which is due out this spring, Koité brought in a new cast of musicians and instruments. He kept the name Bamada, which is slang for a resident of Bamako, Mali’s capital. On his albums, Koité has always been interested in synthesizing the diversity and richness of Malian music. His new band members come from different parts of the country and play a variety of African and western instruments. He’s even added a banjo. Soo is the Bambara word for home, which is where the album was recorded—in Koité’s home studio in Bamako. Recent unrest in Mali, particularly in the north where terrorists connected to al Qaeda in the Islamic Maghreb (AQIM) banned music and dance, has done little to discourage Koité. A number of other well-known Malian musicians have sought refuge, at least temporarily, in Paris, but Koité continues to live in Mali, where music is as essential as food and water. Henderson knows many people in Taos who are familiar with Koité, but few of them have ever seen him live. Koité usually plays theaters, performing art centers and world music festivals, so a show at a club venue like Taos Mesa Brewing is a rare treat. “This show should be a Taos Classic,” says Henderson. Local favorites Brent Berry y Tambien open. Tickets are $18 in advance at Bodega Fresca and Magnetic Records or at taosmesabrewing.com.